Symposium > HR Blogs > Flexible working hours: the right approach for your business? Friday 6 May is Flexible Working Awareness Day – the opportunity to champion those businesses that offer their workers adaptable hours and to raise awareness of the potential benefits of flexible working arrangements for those companies that haven’t yet caught on. With so many businesses now offering this to their staff, is it time that every employer does so? Or does it simply not work in some industries? It seems the reign of the rigid 9-5 working day is coming to an end – much to the delight of a sizable proportion of the British workforce. A new study by facilities management specialists Direct365 showed that 35% of employees would choose flexible office hours as their number one employee benefit. But are employers listening? As of 2014, those who have worked for their employer for at least 26 weeks have a legal right to apply for flexible working arrangements. What are the benefits of flexi-time? The arguments for and against flexible working hours will rumble on for years to come. For some companies, it’s a unique way to give staff the trust to perform as well at home as they do at work. For others, however, it’s perceived as the end for the traditional workforce and that ‘team’ ethic that hundreds of UK businesses have been built on for decades. One thing’s for sure, the desire for flexible working hours among UK employees is growing all the time and is likely to become something that workers come to expect, rather than seeing it as a privilege that is nice to have. For more information, book your place at Core Values and Human Resources – How values support a healthy organisational culture where you will learn what are values and why they matter to HR, the four types of values and how to choose values to deliver behaviours. 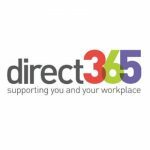 We are Direct365. We started out life as a little business providing just a few essential services and everyday products to a wide selection of businesses. Now we've grown in size, services, products and reputation to become an established and trusted partner to lots of customers across the UK covering a plethora of different trades and requirements.